If you take one of our webinars, attend one of our in-person seminars or hire us for custom in-house training, you’ll receive the very best digital media training the world has to offer. Why? Our Number One priority is helping you increase sales and decrease costs. ACADEMY instructors have been involved in interactive media sales and buying since the World Wide Web became available for business. Through our world-class training, an abundance of media professionals have dramatically improved their knowledge and skills on how to buy and sell digital media. From start-ups to Fortune 500 companies, from small & large advertising agencies to multi-brand media publishers – we have trained them all. And with impressive results, so we’ve been told. Don’t ask us, ask our students “Who has the best digital media sales training in the business?” As the industry’s original media training company specializing in online selling and planning/buying courses, the ACADEMY of DIGITAL MEDIA continually strives to set the quality bar as high as possible – and always against our own ridiculously high standards. But don’t take our word for it. With over 100,000+ students trained, we have a wealth of feedback on how we compare to other training companies, and how much this quality standard really helps our students succeed at their job and in immediately turning a profit. Read student feedback after being trained by the ACADEMY. How do we maintain our status as the gold standard of digital media training companies? We use only the best. ACADEMY courses are created by guru-level industry experts and then optimized by an in-house training professional with Master Degrees in both Teaching and Instructional Design. You get not only the right content, but in a way that uses the latest in adult learning methodologies and teaching techniques. We never endorse. Unlike many other training companies, and especially industry association training, ACADEMY never uses vendors as instructors. We use only professional, experienced instructors with nothing else to sell and no agendas to promote. You learn what you really need to know, not how to buy the vendors products or services. We walk the walk. Ask any of the other training companies if they have actually every bought or sold digital media. Our instructor base has years of real world digital sales and buying experience. We speak often at industry conferences as the go-to gurus. No posers here. We listen. Although we are loaded with digital media knowledge and are constantly on the forefront of what’s new and emerging, from the beginning we’ve rigorously applied a student feedback review process. We use your input to constantly make improvements to our courses. You learn. As a result, you receive over 30+ years of finely-tuned elite training programs that are more effective than any other digital media training available today. You profit. Be one of the countless that has walked away armed with the in-depth knowledge and skill set that you can put to use immediately. Even though we blush, we never tire of hearing about the never-ending cases of instant ROI. See full roster of ACADEMY of DIGITAL MEDIA courses. 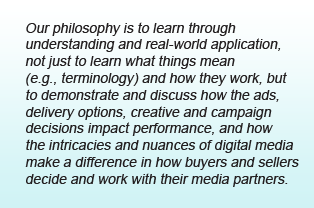 For our custom, in-house corporate clients, the Academy of Digital Media builds confidence and proficiencies in sellers and buyers by weaving the essential components of digital media into the course materials and learning exercises. Courses are customized to reflect the team’s experience, available and future media options, clients and competitors. We organize content to include “what” capabilities or media options, the underlying “how” it works, and emphasize the “why” it works. Approaching the sales conversation with these elements will successfully change the strategies and negotiations for how media is bought and sold. Our philosophy is to learn through understanding and real-world application, not just to learn what things mean (e.g., terminology) and how they work, but to demonstrate and discuss how the ads, delivery options, creative and campaign decisions impact performance, and how the intricacies and nuances of digital media make a difference in how buyers and sellers decide and work with their media partners. In addition, we create an environment that allows for sharing and encourages creative thinking about the opportunities and possibilities, including role-playing, coaching and practicing what was learned. See full roster of ACADEMY of DIGITAL MEDIA courses.